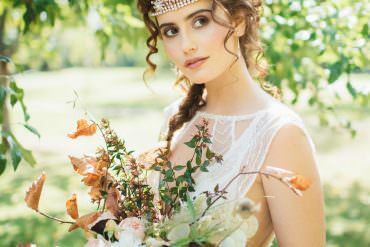 It really doesn’t get any more stylish than a rose gold and botanical theme for a wedding now does it? 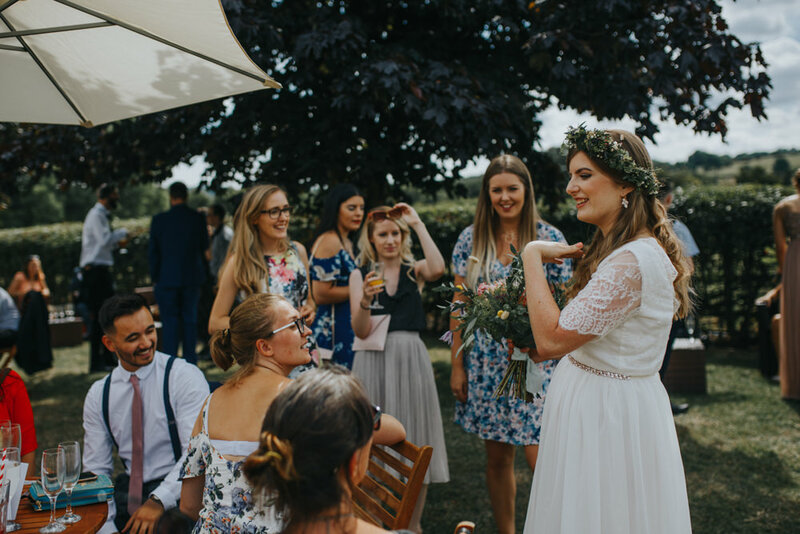 Then team that with a beautiful ethical wedding dress, an outdoor ceremony and an amazing vegan feast for all! Wow. 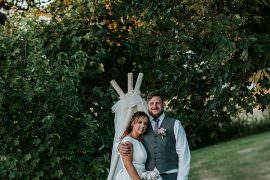 WWW readers Niamh and Chris were hitched on the 4th August 2018 at Shiningford Manor in Derbyshire. 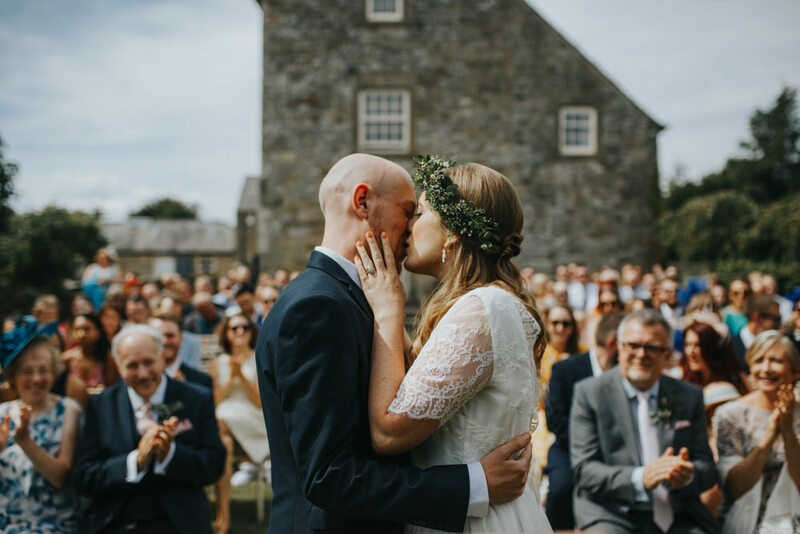 They loved the venue so much that they waited two and a half years to marry there, it suited their wedding vibe and the accommodation was perfect for their nearest and dearest. 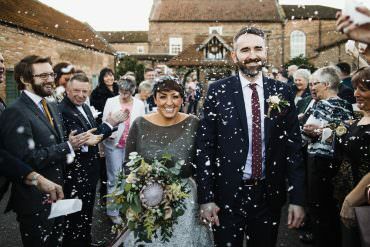 I really like their wedding planning approach, of tackling the expensive elements first, to ensure that less important decisions were left to the end, just brilliant. 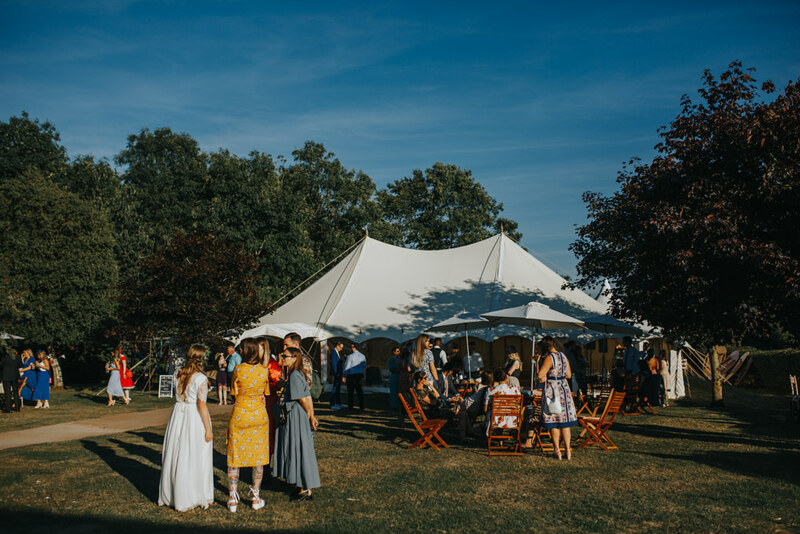 There is so much to love here today, from the epic photographs by Magda K Photography (thank you Magda! 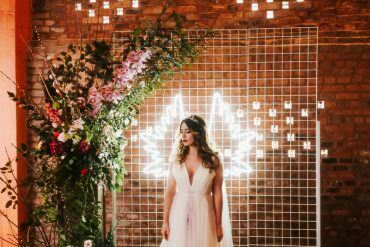 ), and the beautiful triangle backdrop adorned with greenery to the entertainment and the naked cake. Oh my! Chris proposed on a trip to Edinburgh in the February of 2016. I had planned and booked the trip so had no idea that Chris was going to propose! After a couple of failed attempts during the trip, Chris decided to pop the question at the top of Calton Hill. Hilariously, he pulled out the ring box wrapped in a plastic bag (he was worried it might get wet as the weather hadn’t been great) and I hadn’t a clue what he was doing. He’d picked a beautiful vintage opal ring that he’d found in the lanes in Brighton and of course I said yes, despite being in complete disbelief. 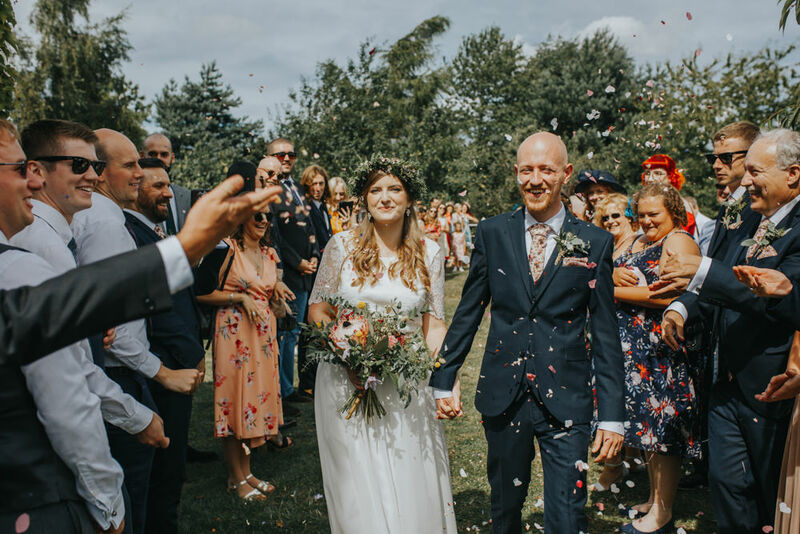 We wanted the wedding to be relaxed and more like a huge party then anything else – that was important to us from the very beginning as we knew we would never enjoy a traditional style wedding. 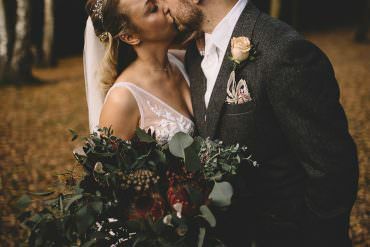 We both love the outdoors and wanted to incorporate this into the day as much as possible. 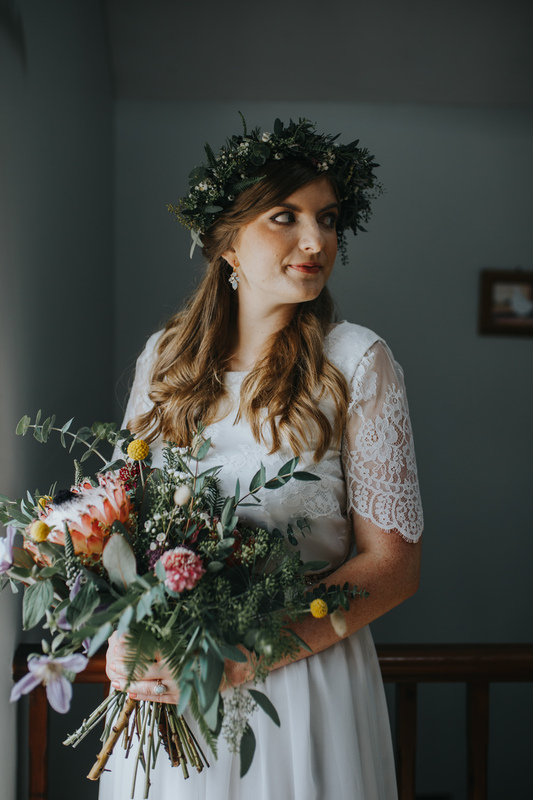 Of course I’d already created a Pinterest board and initially it was full of a mix of lots of different styles but we noticed that we both really liked minimal décor with boho and botanical style touches. 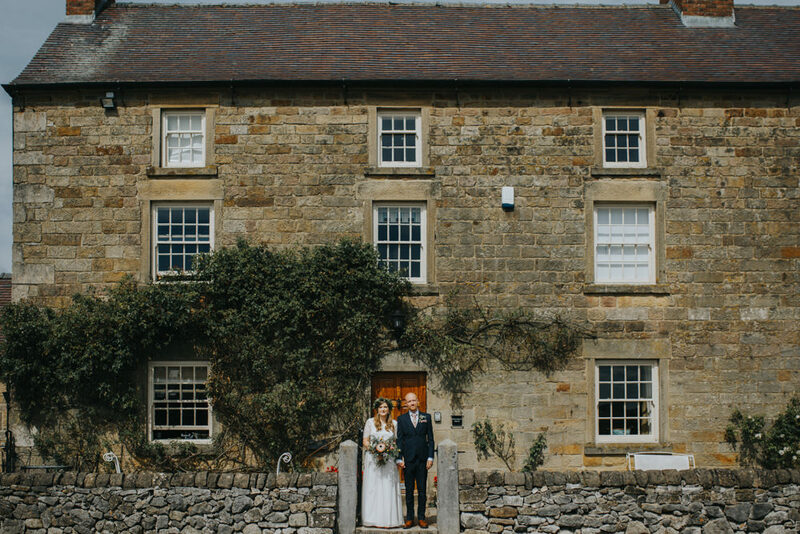 We were lucky in many ways that our venue we chose wasn’t available until two and a half years after the proposal. This meant that we had lots of time to plan and save up money for the wedding. 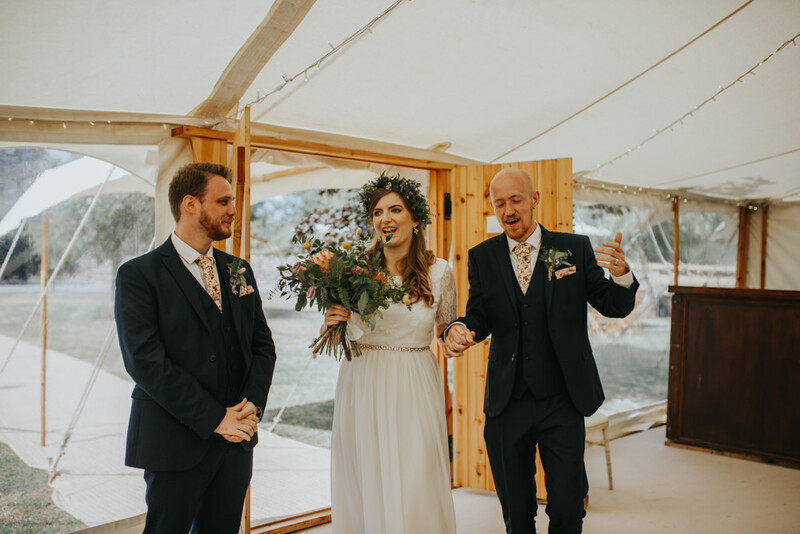 Because our venue wasn’t set up as a wedding venue, this meant that we had to book each element of the wedding ourselves. 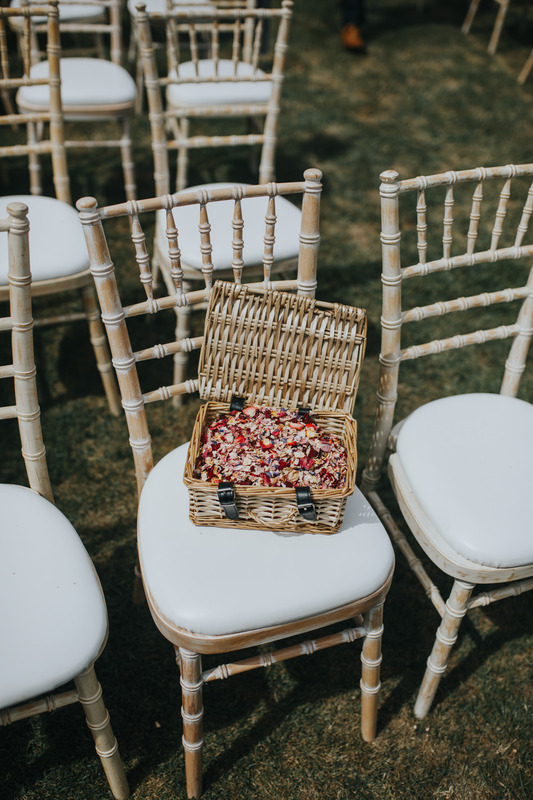 Having a lot of time to plan this was incredibly helpful as we could take our time and find suppliers that we really loved by scouring the internet and following up on recommendations from friends. 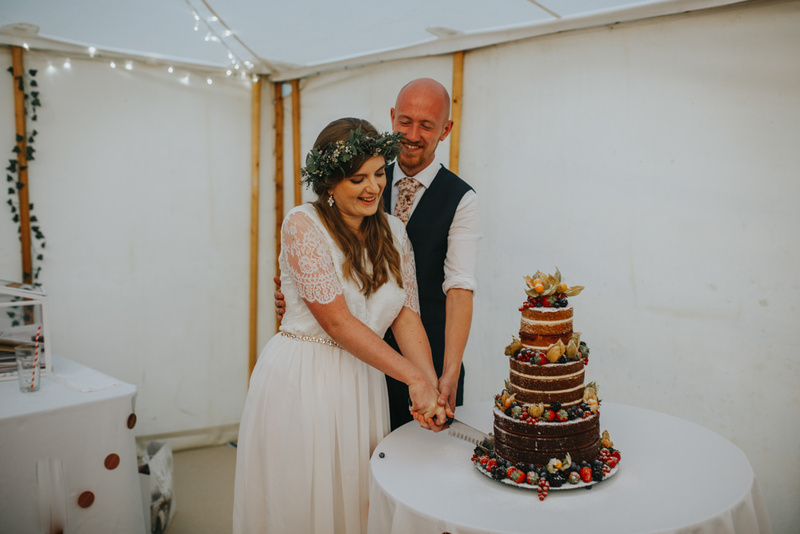 The catering was one of our biggest priorities as I’m vegan and Chris is vegetarian; we wanted something special to impress our meat-eating guests. 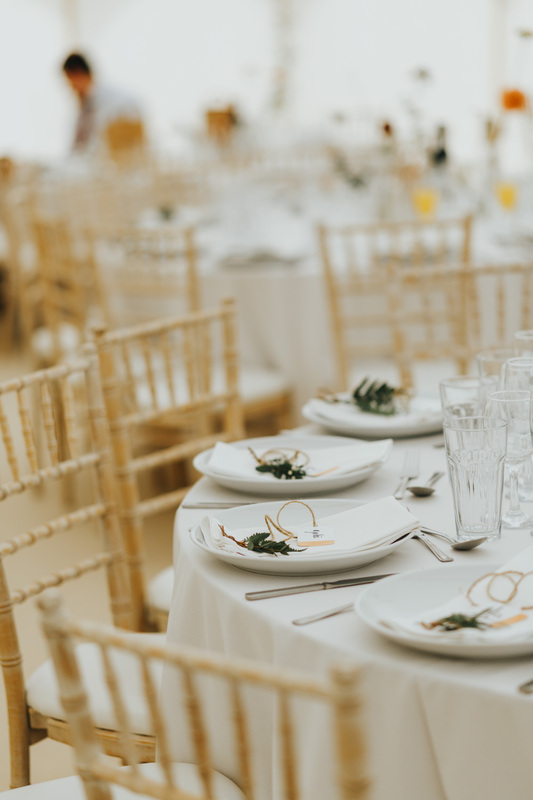 After booking in Thomas the Caterer, who designed an incredible Mexican inspired feast for us, we worked our way down from the most expensive elements of the wedding to the least expensive. This meant that the less important decisions were left until the end, making the process less stressful. 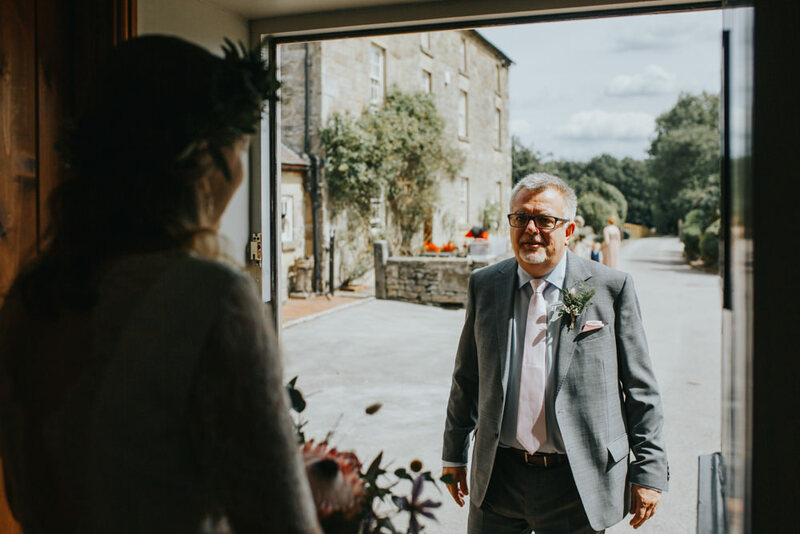 Our wedding was held at Shiningford Manor, with fabulous views over Carsington Water, a reservoir in the Peak District. 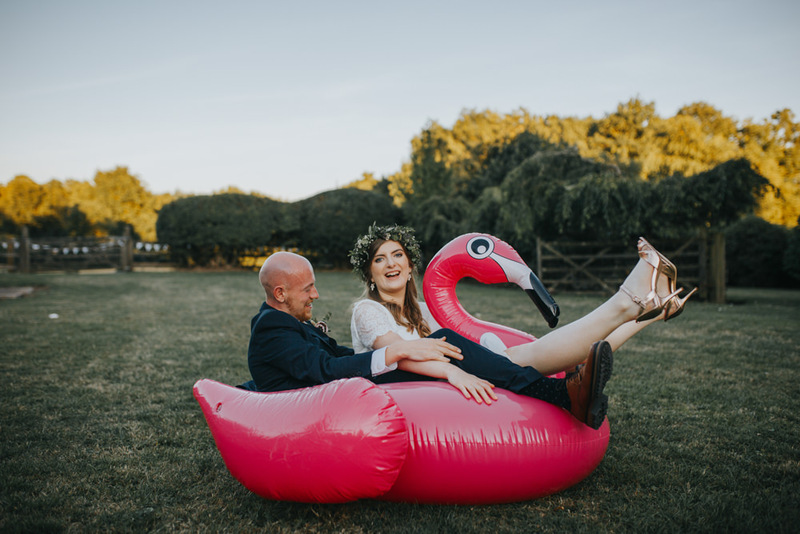 Shiningford is a huge manor house with stables converted into a separate living space, a swimming pool and hot tubs and, most importantly, sleeps up to 34 people – perfect for the laid back, holiday/party vibe we had wanted. 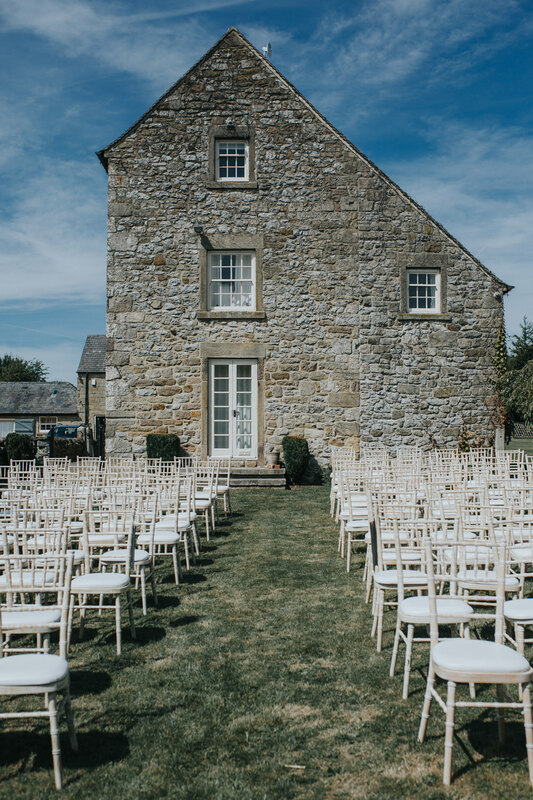 We instantly fell in love with the venue and its location, which is why we were willing to wait for two and a half years before we could get married there. 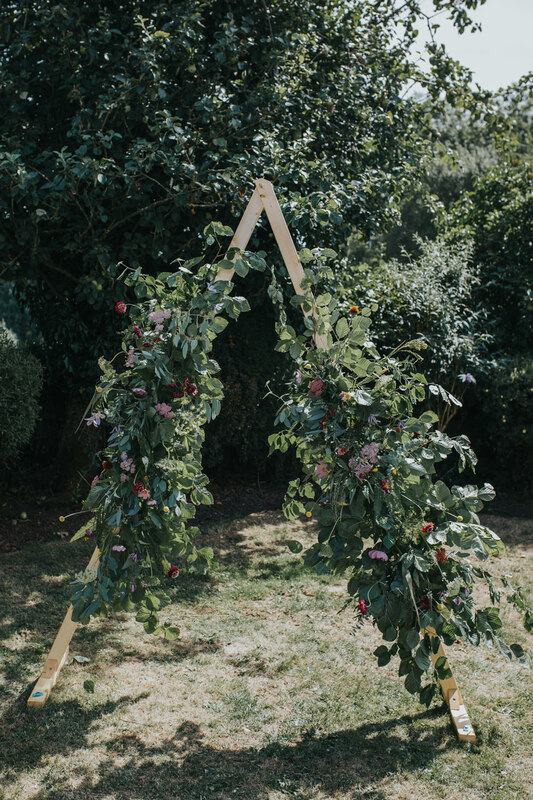 We had the ceremony in one of the small gardens next to the manor house with the aisle leading down to a triangular arch that our florist decorated with the most beautiful mix of foliage and flowers. 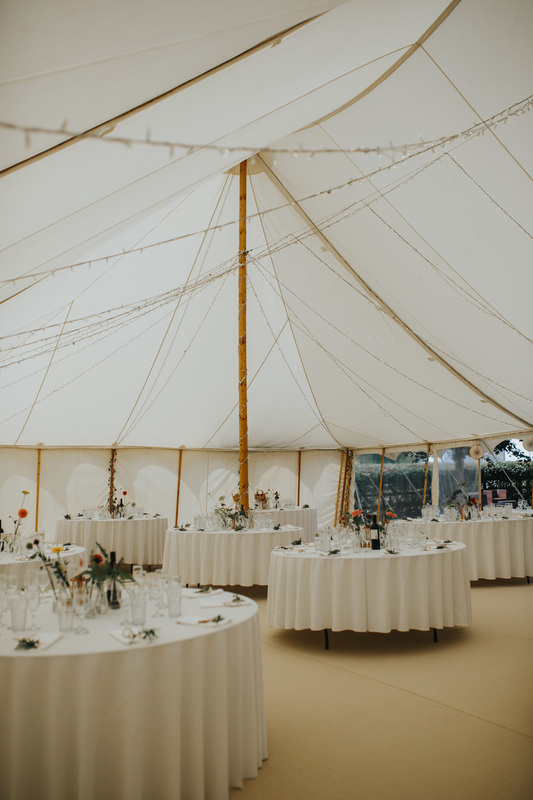 For the reception, we chose a petal pole marquee from Top Marques. 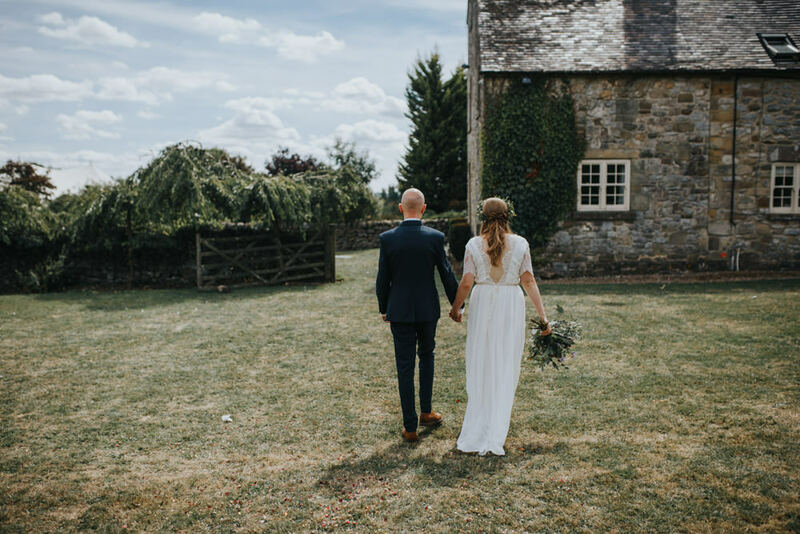 We loved the mix of the wooden poles, white canvas and raised sides so that we could look out over the beautiful manor house and grounds. 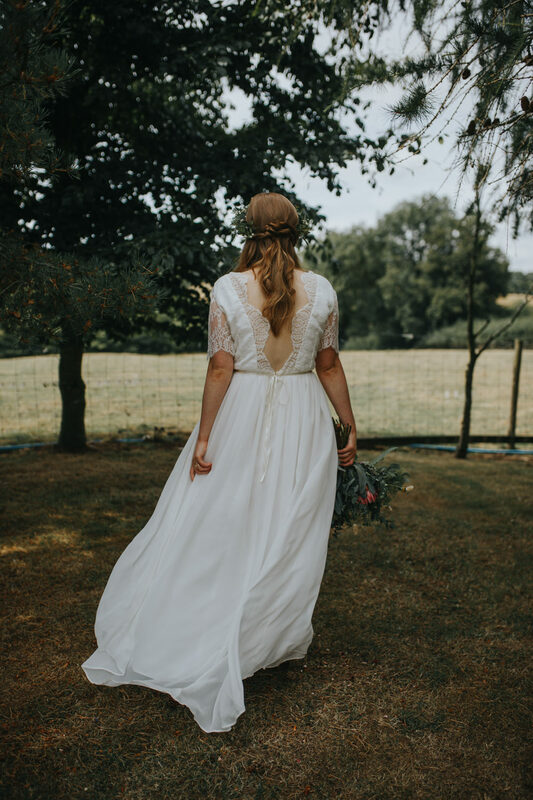 I knew that I wanted an ethically made dress from the very beginning. I did plenty of online research but didn’t find anything I liked until I stumbled across Luna Bride in a blog post. 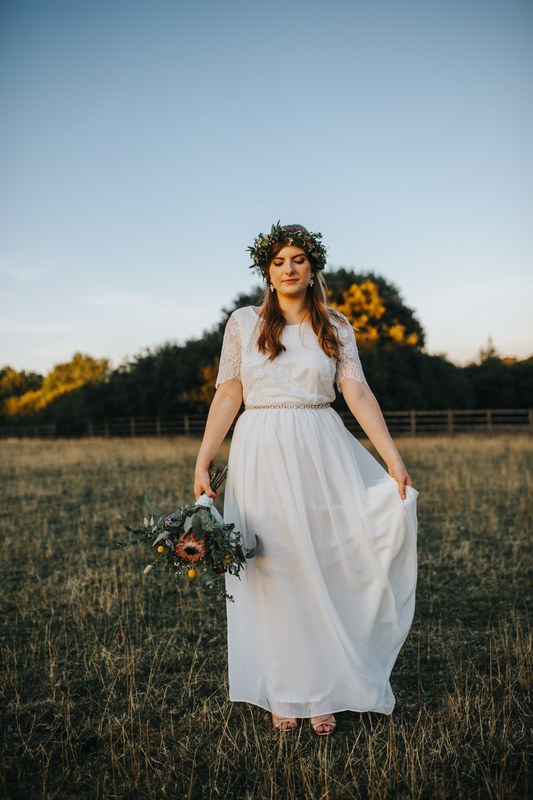 Keely uses fair trade and organic fabrics, something that was incredibly important for me. I also wanted something that would be light and comfortable but beautiful and the Beach dress ticked every box. I ordered a rose gold belt to tie the dress in with the colour theme of the wedding décor. My earrings were from EldorTinaJewelry, a seller I found on Etsy. The pair I chose were rose gold to match the theme of the wedding and the opal perfectly complimented the stone in my engagement ring. 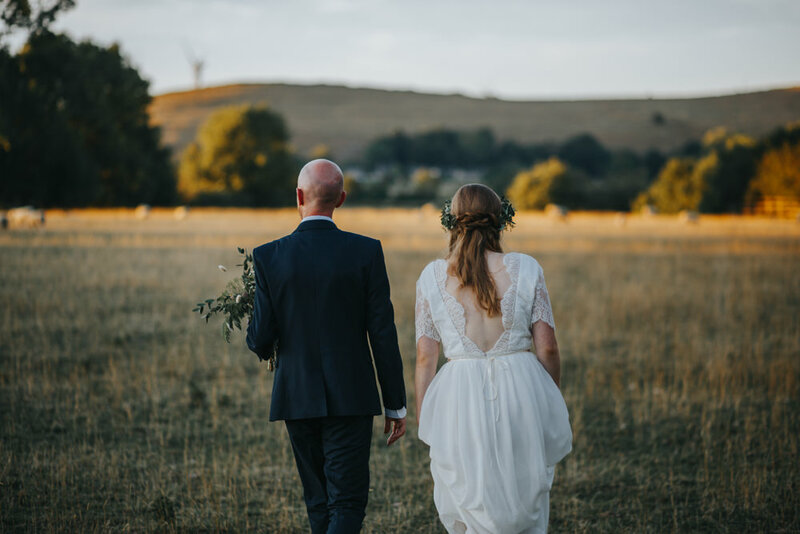 I hadn’t planned on getting changed in the evening but we had our legal ceremony two days prior to the wedding and I’d worn a gorgeous Needle and Thread dress which was shorter and therefore easier to dance in so ended up changing after we’d had our couple photos taken. 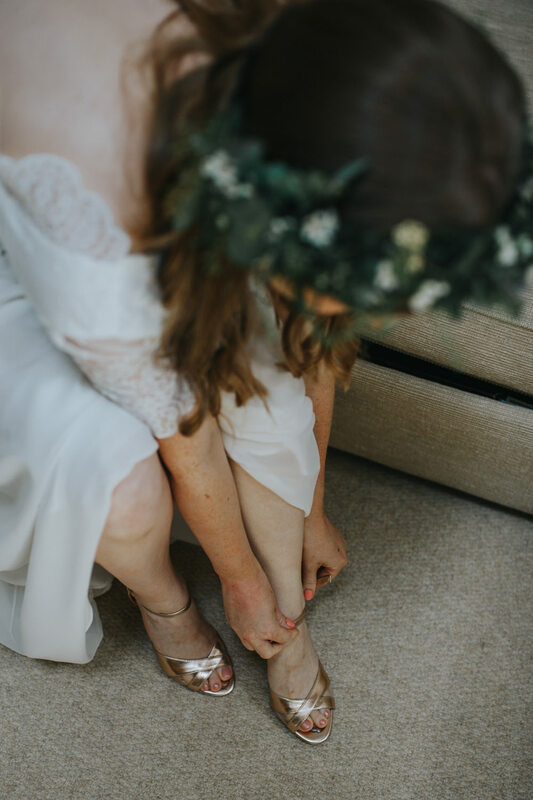 My shoes were from Dune and were rose gold strappy heeled sandals. 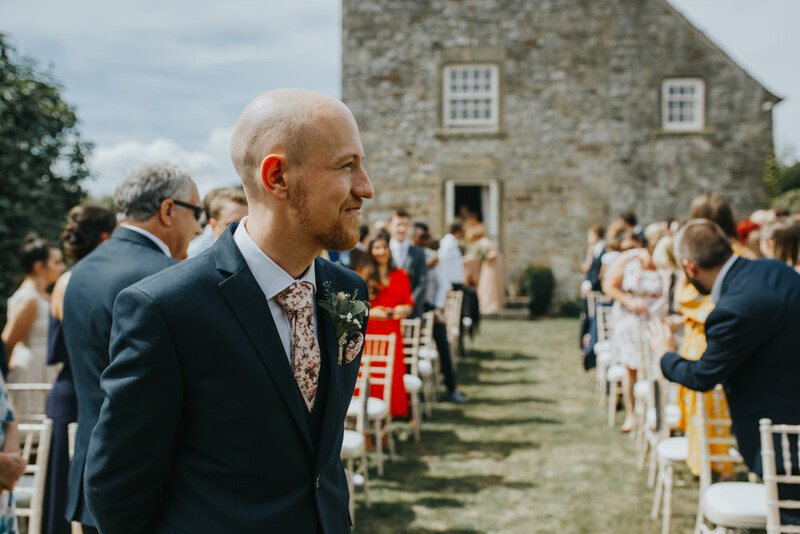 I’ve never been particularly confident with hair or make-up and didn’t want to stress about it on the day so contacted Beau Hair Academy who are based in Derbyshire. I knew that I wanted my hair down and Sarah, the hair stylist, recommended this as it would help my flower crown stay in. 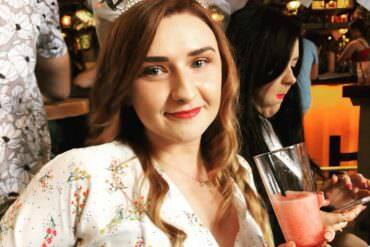 I wanted the make-up to be fairly neutral but also to last all day, especially during the dancing, so that I wouldn’t have to nip off to top it up during the day. I had worried somewhat during the trial as, although I loved the look Michala created, I felt that I didn’t look myself with all that make-up on. She listened to my concerns and did such an amazing job on the day. I felt confident and didn’t have to reapply anything all day. 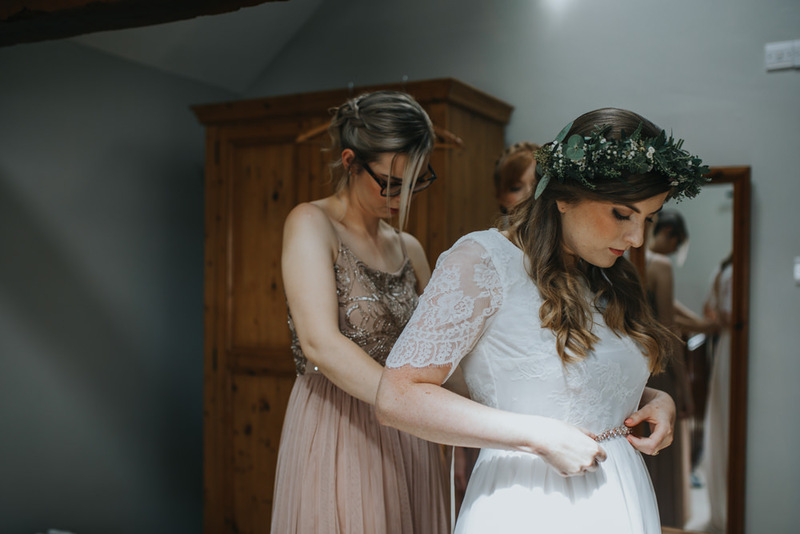 My only instruction for the bridesmaids was that I wanted them to have their hair up and plaited. I wanted to make sure that everyone felt comfortable so suggested they selected whatever they wanted for the make-up. 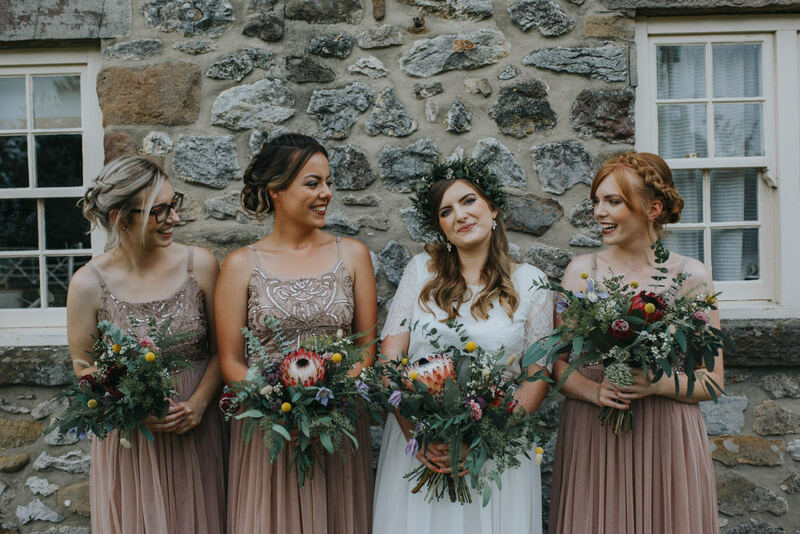 I love how each style differed and they all looked stunning! 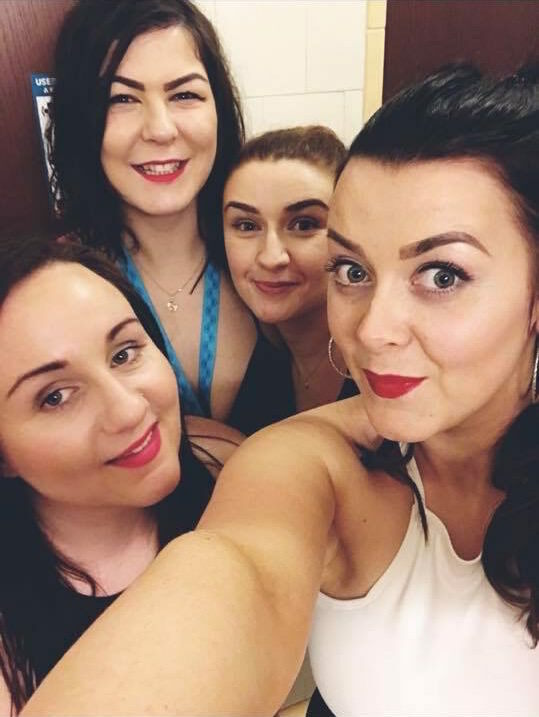 We had three beautiful bridesmaids: my sister, Chris’ sister and my best friend. 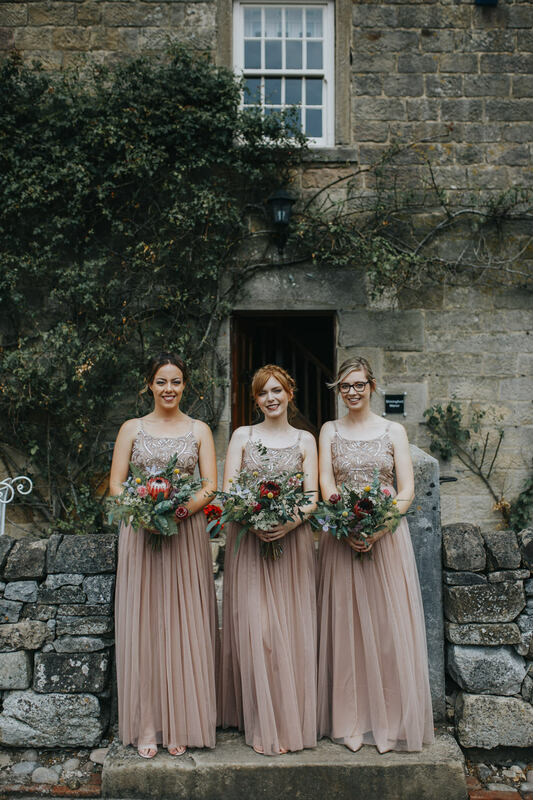 We found the bridesmaids dresses on ASOS. We wanted dresses that, again, would be comfortable and light weight, and in a neutral colour. 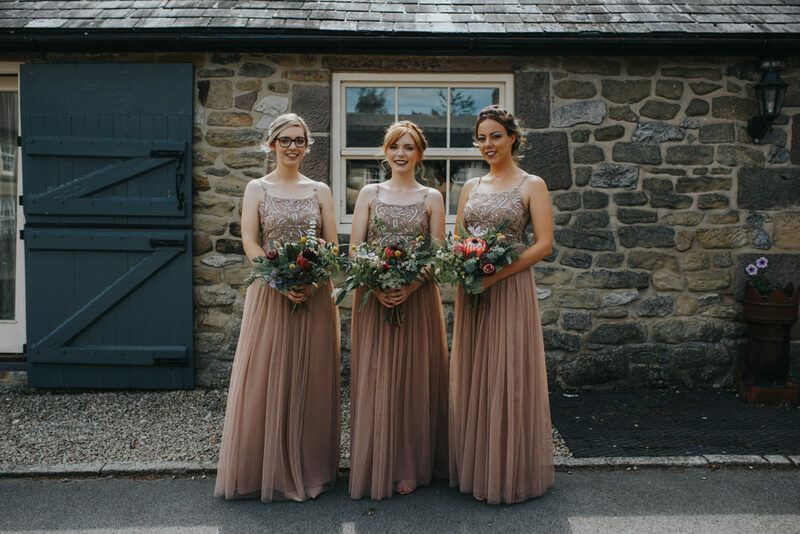 I loved the blush pink colour and the embellishment on the bodice of the ones we chose and luckily so did all three bridesmaids! They were all free to choose whichever shoes they felt most comfortable with and funnily enough, they opted for very similar pink heeled sandals. 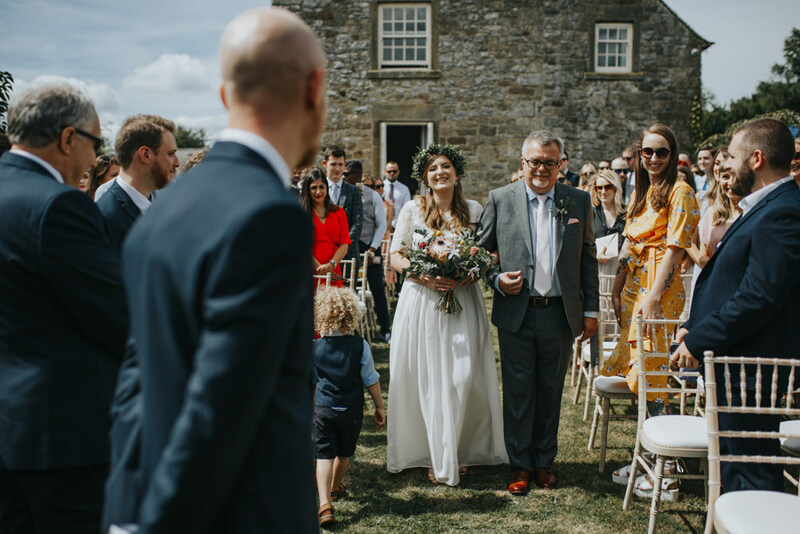 We decided that my best friend’s son and our niece would join the bridal party and walk down the aisle with the bridesmaids (although, of course, that didn’t go quite to plan). 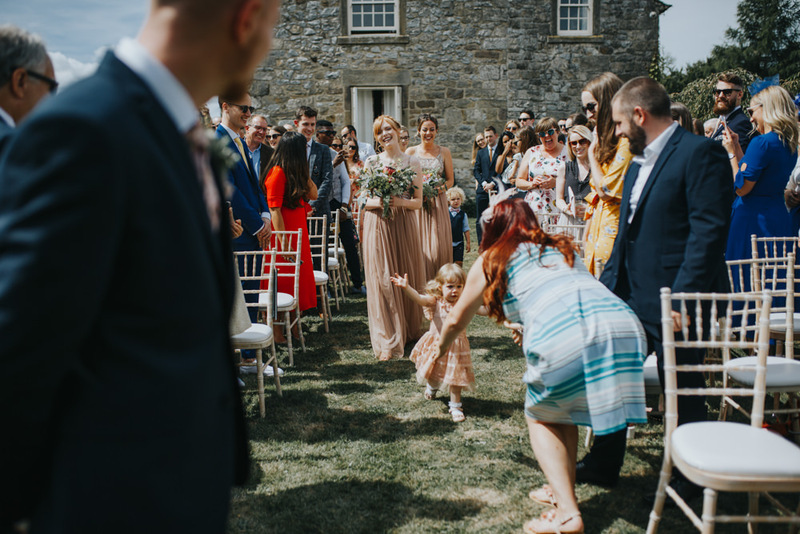 Matilda, our niece, wore a dress from Next in the same colour as the bridesmaids and Rohan, my friend’s son, wore a navy short and waistcoat set and blush pink bow tie to match with the groomsmen. They both looked adorable! 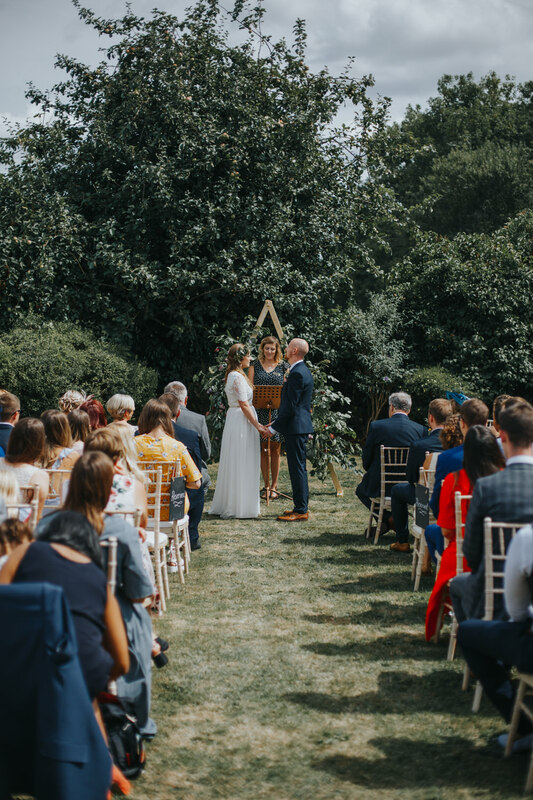 We asked my brother and our friends, Emily and Sarah, to give readings during the ceremony. 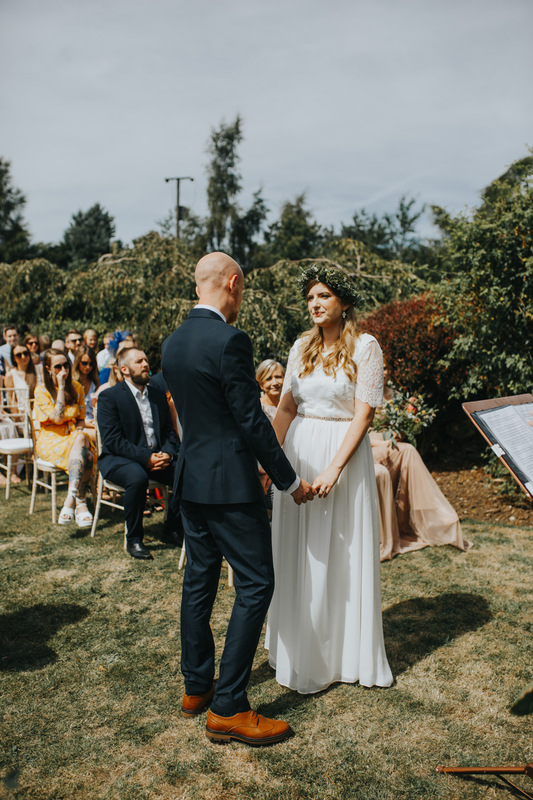 We both wanted them to be a surprise so they each did some research to find something and sent it straight to the celebrant to be added into the ceremony. 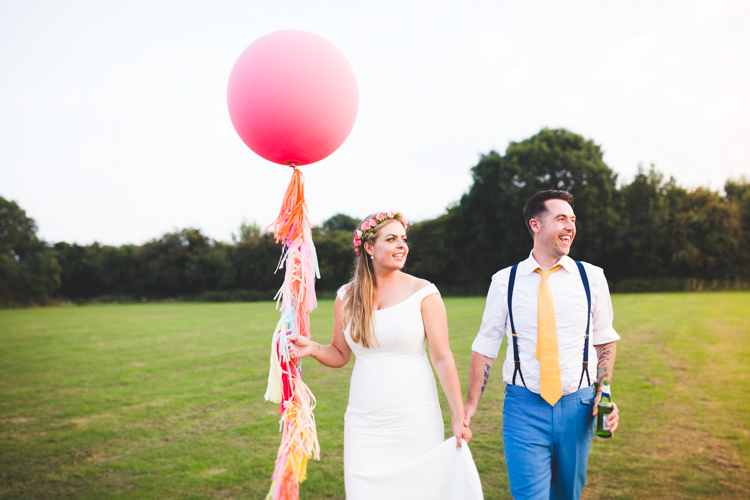 As we’re both huge music fans, this was an important aspect of the wedding for us. 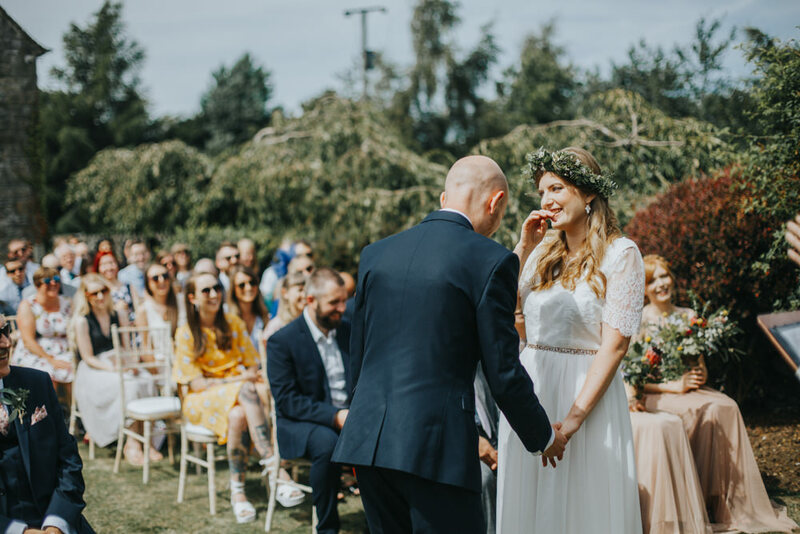 We made a different playlist for each part of the day: ceremony, wedding breakfast and evening. 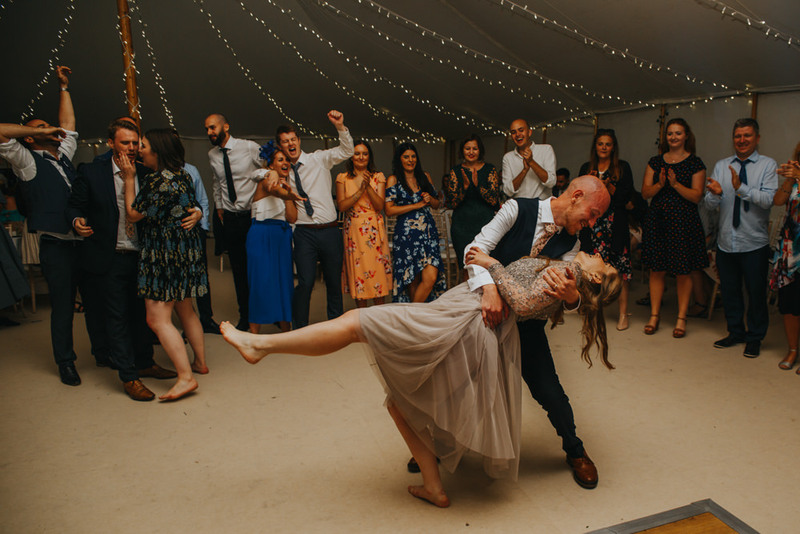 Planning each playlist was a lot of fun as we scrolled through our favourite songs whilst dancing around the living room. 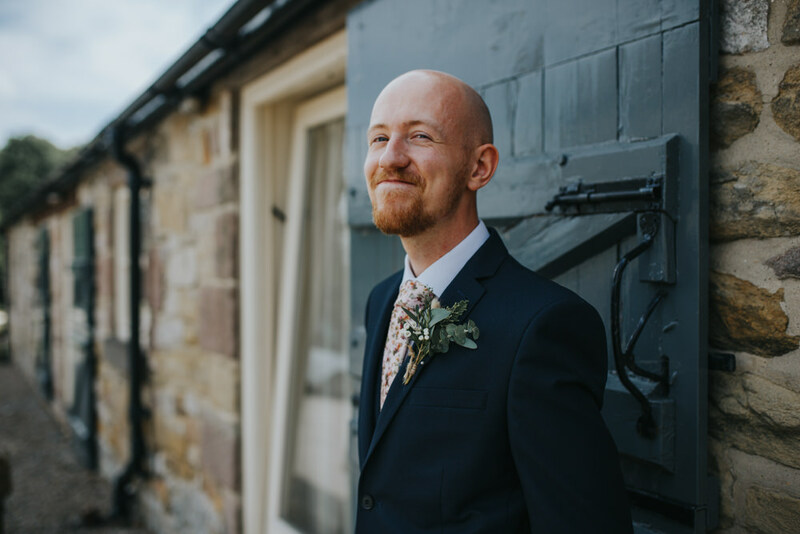 We had Hans Zimmerman’s ‘True Romance’ playing as I walked down the aisle and ‘Ocean Avenue’ by Yellowcard, a song that we listened to a lot when we first began dating, as we signed the register. We also booked a ceilidh band, The Tartan Trio, for the evening on a recommendation from a friend. 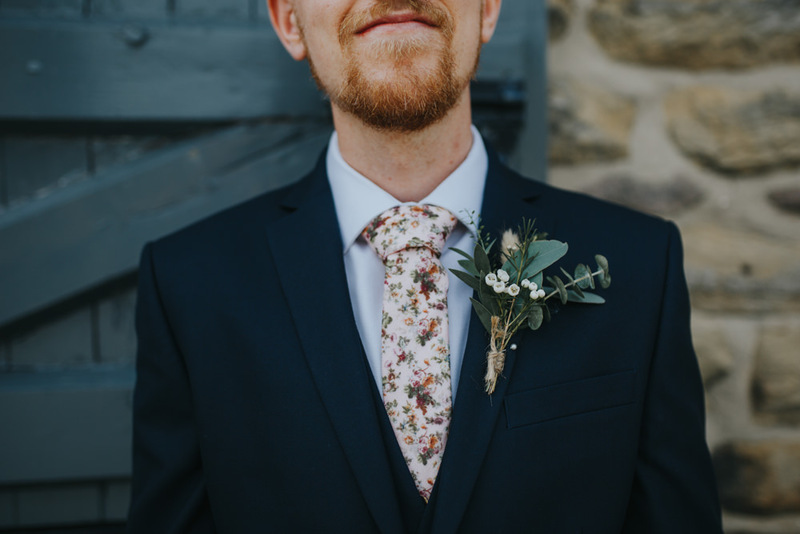 My family are Irish and we felt it was important to recognise this in some way in the wedding. 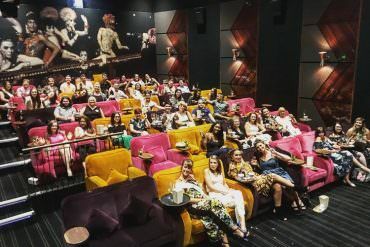 It was the best decision we made as our guests loved it and it got everyone chatting and having fun together. 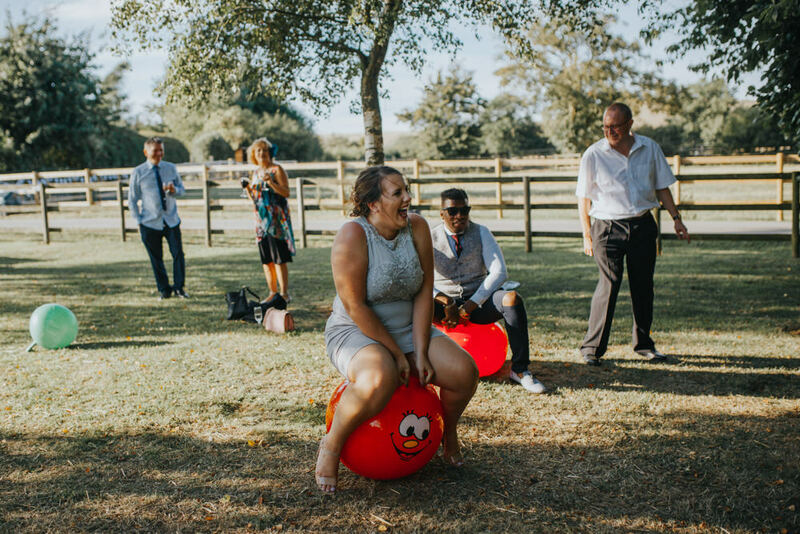 Some of the best pictures are of this part of the evening when everyone was caught off guard having a good time. 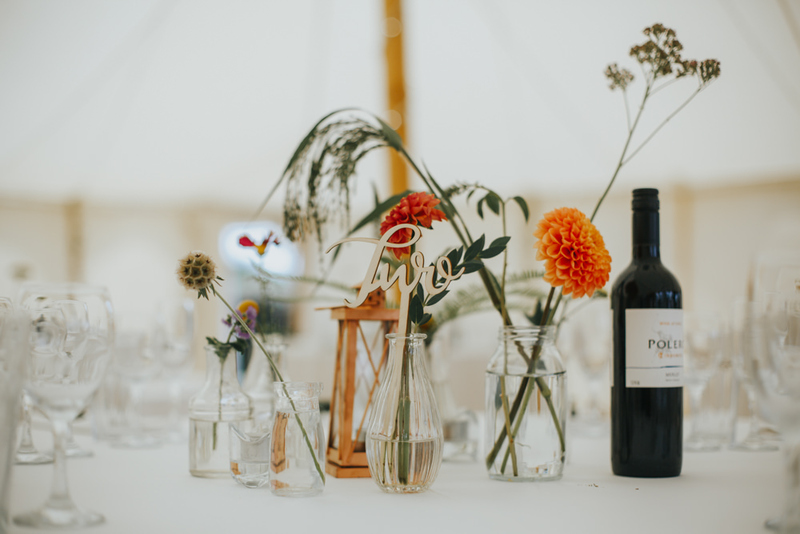 Our flowers were created by the amazing Hattie at Poppy Scout. 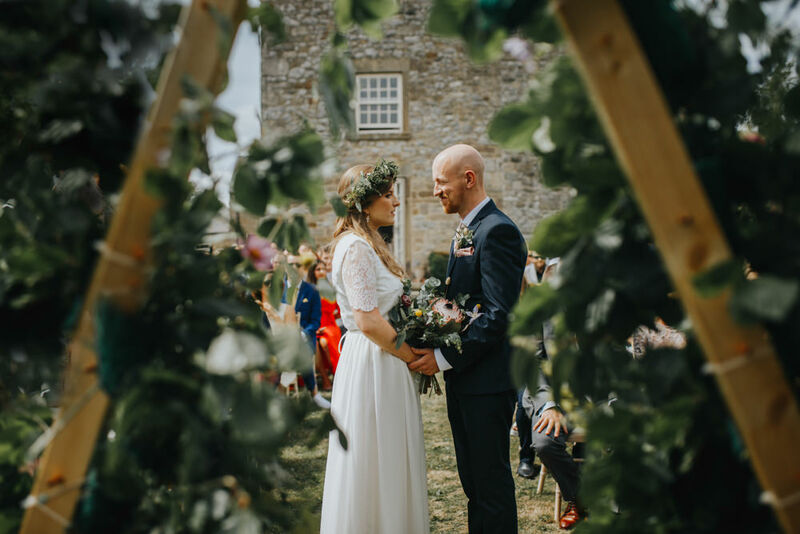 We were set on having lots of greenery with pops of colour. 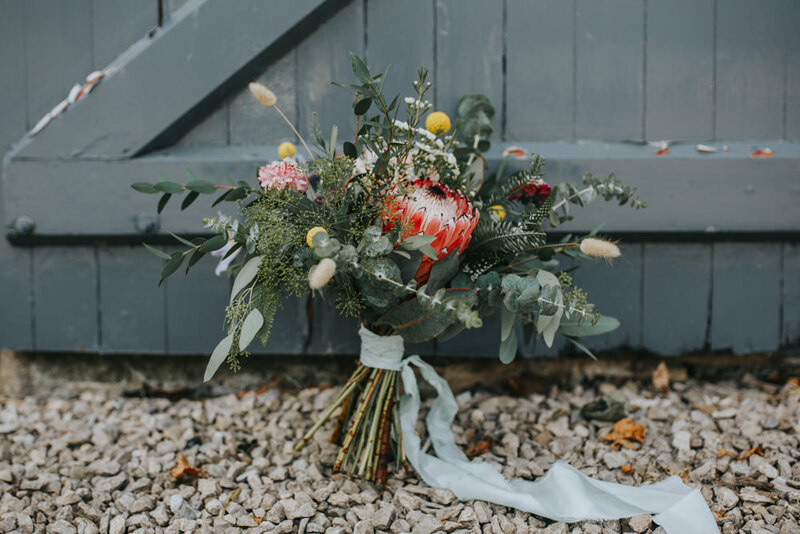 I’d seen proteas in a few bouquets when doing some wedding planning and when we saw them in person on a trip to South Africa, we knew we wanted them to feature in our flowers. 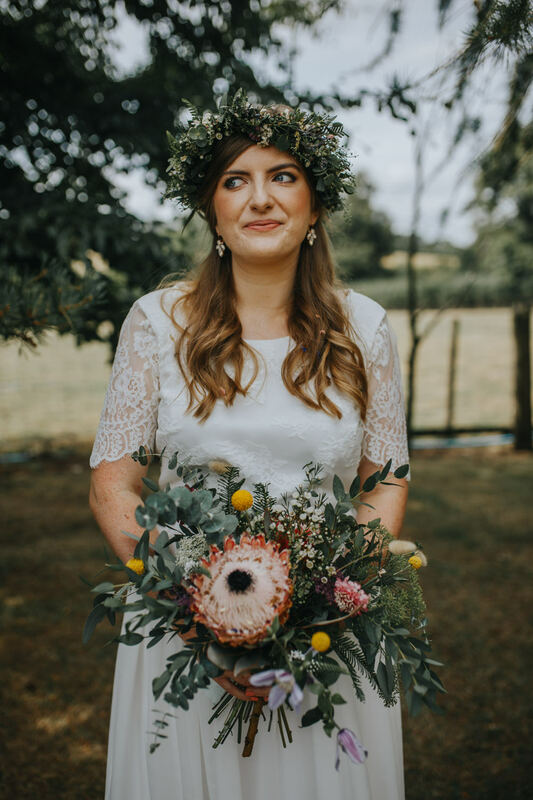 Other than that, we left most of it up to Hattie as we knew she’d do a fantastic job – and she did! 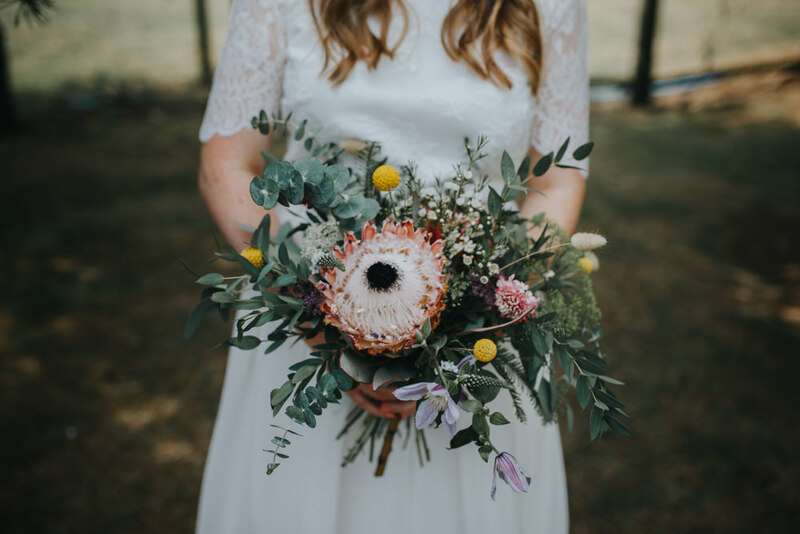 The bouquet contained eucalyptus, fern leaves, pink proteas, yellow craspedias and a mix of other purple and pink flowers. We had mini bouquets made for the bridesmaids and simple button holes of foliage and white flowers for the groomsmen. Before finding Magda, we had looked at a few other photographers but no one seemed quite right. 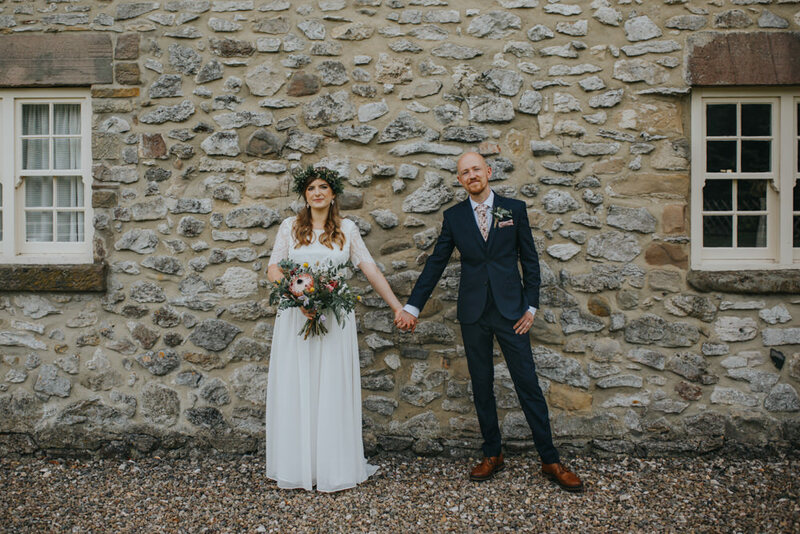 We didn’t want anything too posy as neither of us feel particularly comfortable in front of the camera and when we saw the gallery of photos on Magda’s website, we knew she’d be a perfect fit for us! 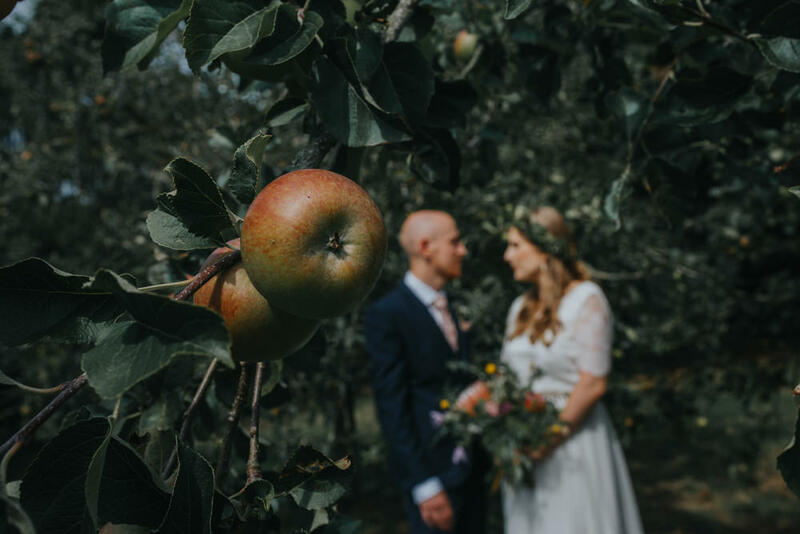 She booked us in for an engagement shoot to help us feel more at ease, something that I’d recommend if the thought of being followed around by a camera all day makes you feel uneasy. 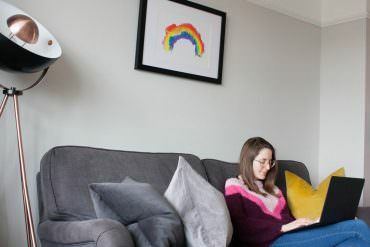 We love the colours in her work and how natural many of the photos are. Magda flitted around all day and we hardly noticed she was there; she was just like another guest. We were so lucky to find her and we have some amazing, everlasting memories as a result. 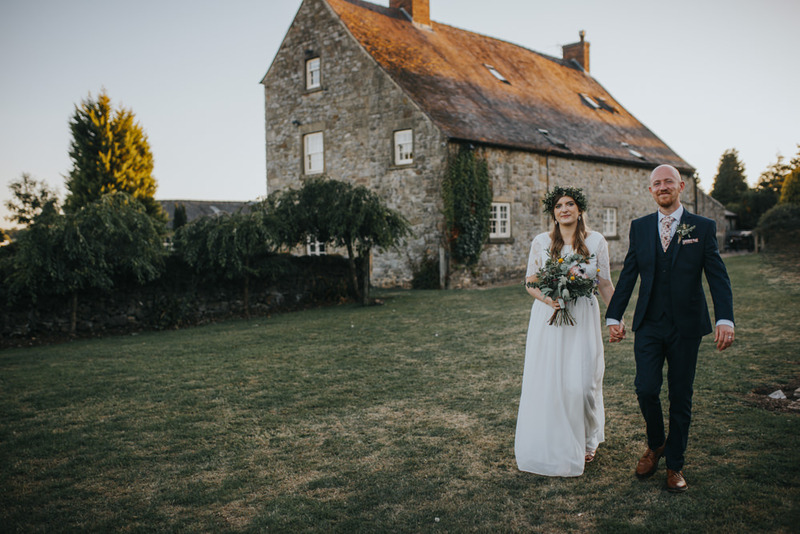 We wanted to keep things simple and stress-free. 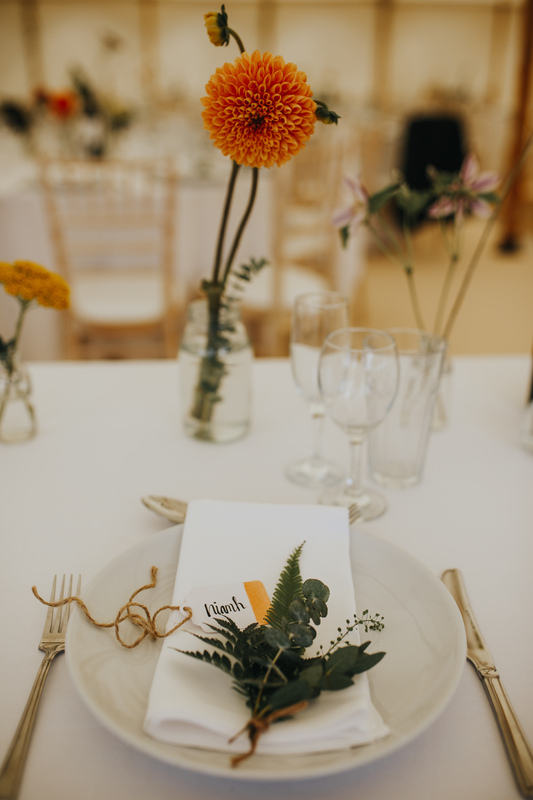 We left most of the décor for the reception to our florist who decorated the tables with vases, flowers and clusters of foliage for each place setting. 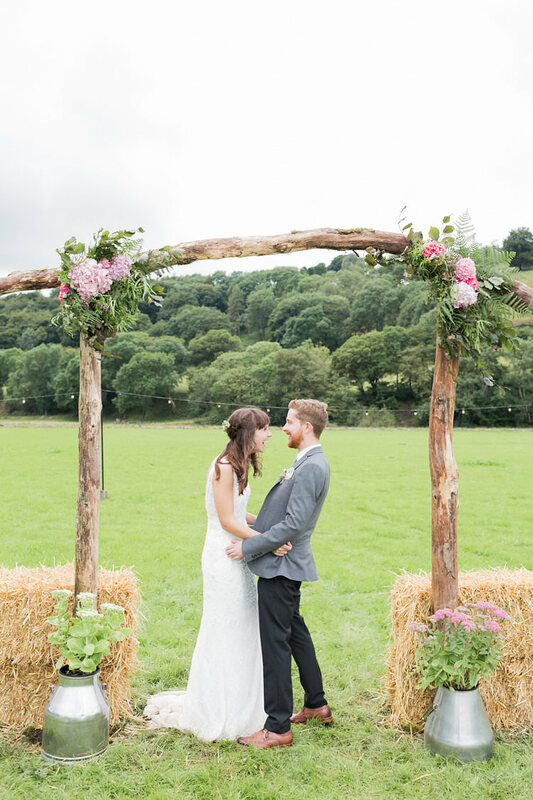 We wound faux ivy around the poles of the marquee and had touches of rose gold here, there and everywhere. 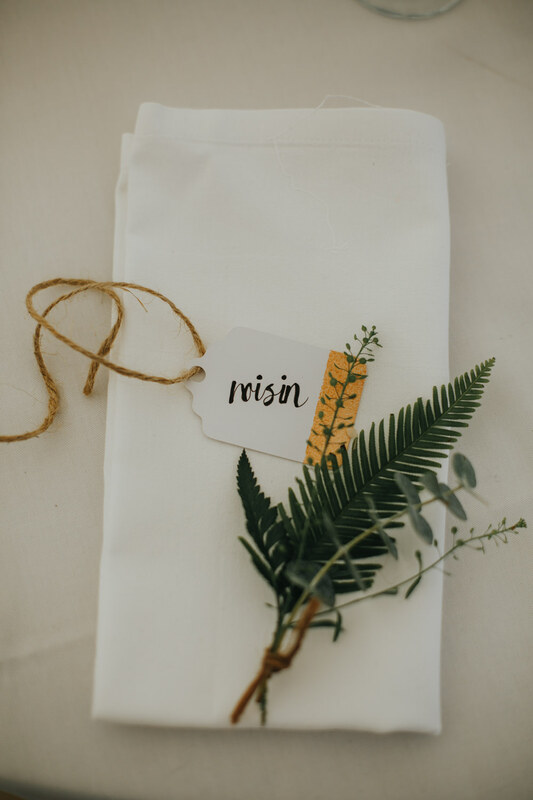 I hand wrote and decorated the place settings, spray-painted second-hand lanterns, passed on from a friend’s wedding, and we made a card box using a tutorial I’d found online. Aside from the flowers, most of the decorations were inexpensive and we enjoyed making a lot of them ourselves on the run up to the day. For our guest book, we bought a second hand instax camera and left instructions for guests on how to use it. Because we forgot to pack our original guest book for the wedding, a lovely friend ran out to pick us up a last minute one on the morning of the wedding. We left out glue and metallic pens for guests to stick in their pictures and leave messages. This worked out so well and we’ve got some hilarious pictures and messages that we’ll treasure forever. One of the most important details for us was the area for the children. 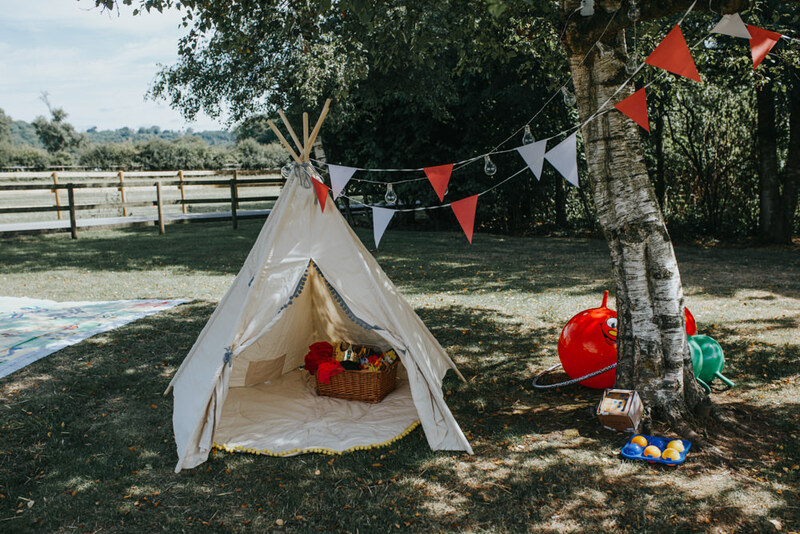 We bought a tepee and filled it with fancy dress items, hula hoops and space hoppers. Niamh’s parents bought some giant board games and these were laid out to the side of the marquee so that the children were occupied after the ceremony. There are so many lovely pictures of children (and adults) who really appreciated this touch. 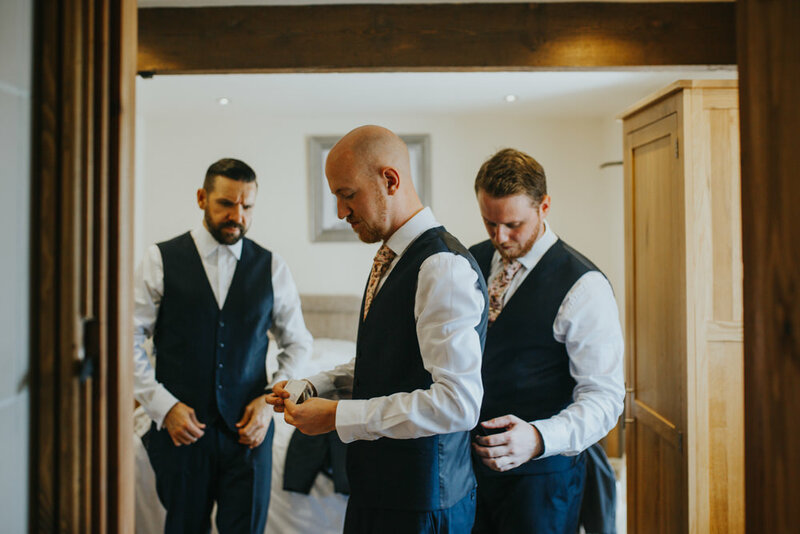 Chris decided on a three-piece, navy suit from Next and pink floral ties from ASOS to tie the groomsmens’ outfits in with the bridesmaids’. 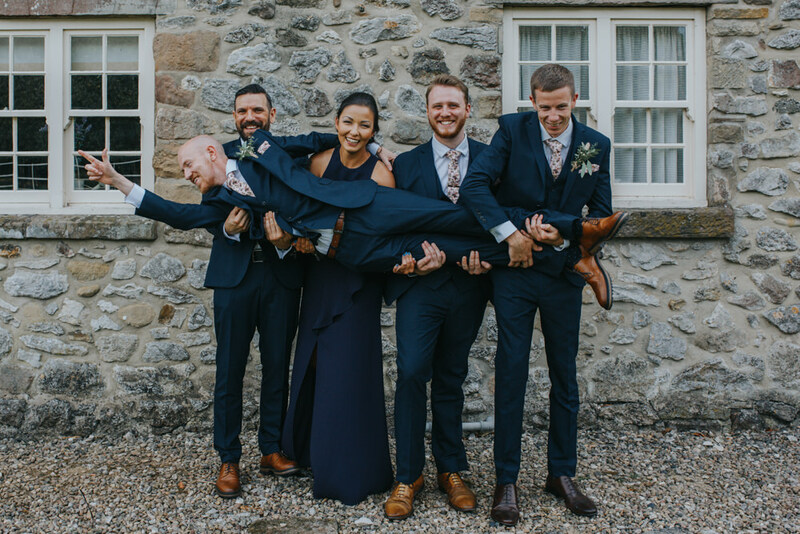 Chris chose tan brogues from Will’s Vegan Shoes but suggested that the grooms men wore any smart brown shoes they already owned as we weren’t too fussed about every detail matching. 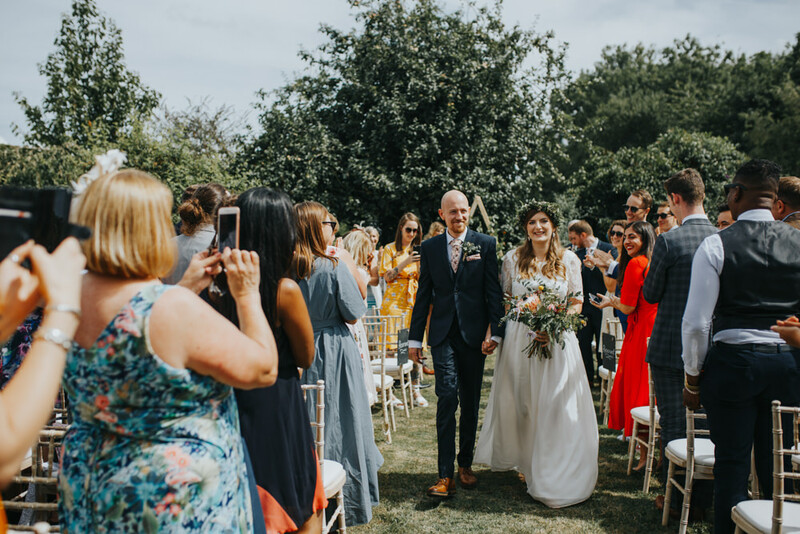 Chris’ best woman, Tara, wore a gorgeous navy-blue dress from ASOS and paired it with white chunky heels from &OtherStories. 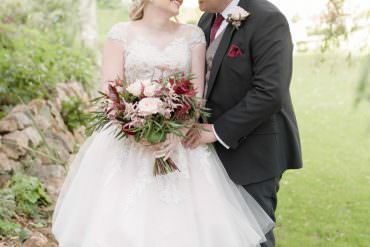 We also had a corsage made for her instead of a button hole to tie it all together. After lots of research, we decided on three weeks in Hawaii (partly funded by our super generous wedding guests). 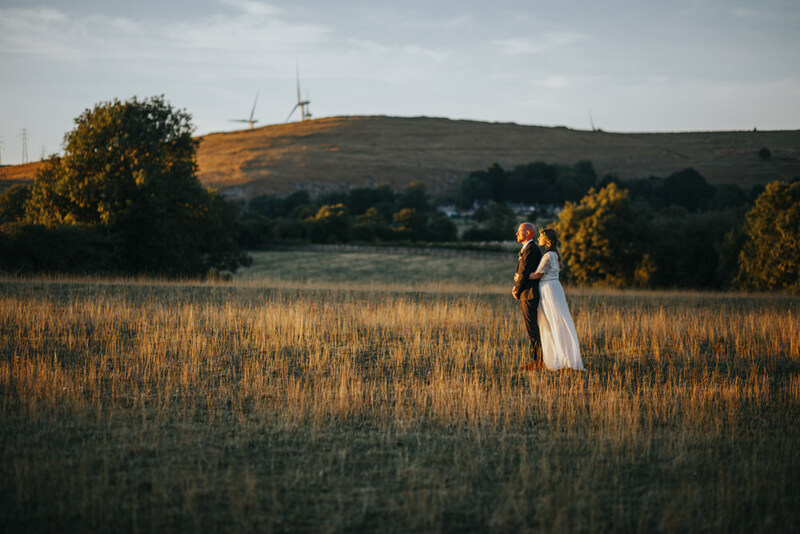 It was the perfect end to our wedding celebrations and we knew that this was the kind of place that we’d never get to visit unless we went for our honeymoon. We snorkelled with manta rays, star gazed from the top of an extinct volcano and kayaked to hidden waterfalls. Such an incredible experience! 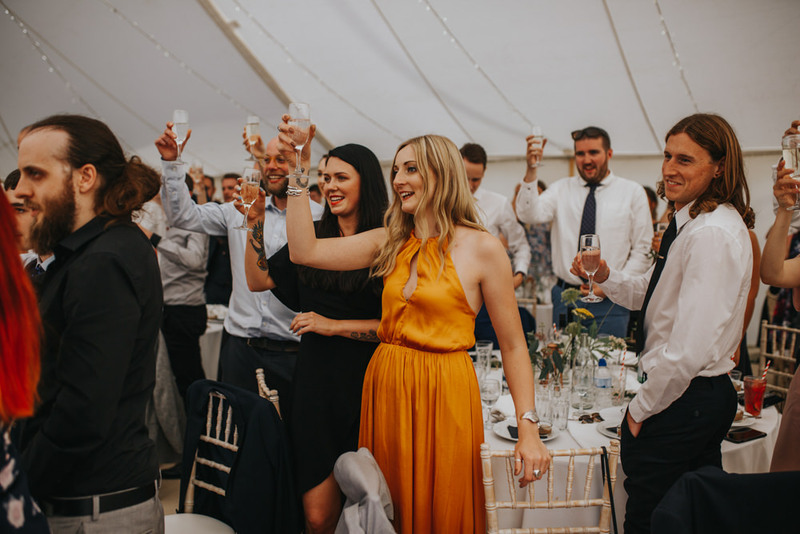 There are so many incredible memories, but I think the two things that stand out the most are the speeches and the ceilidh! 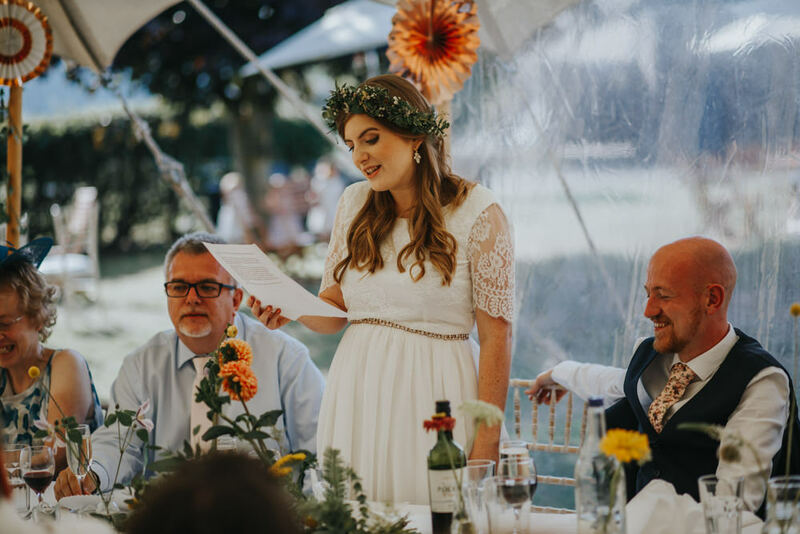 Both of us wrote our own speeches and then asked my dad and Chris’ best man and woman to give speeches afterwards. Our friend recorded these and watching them back is just amazing. We also loved seeing our friends and families come together during the ceilidh. Even some of our guests who said they never danced joined in! Celeste at the Nottingham Wedding Cake Company did an incredible job. 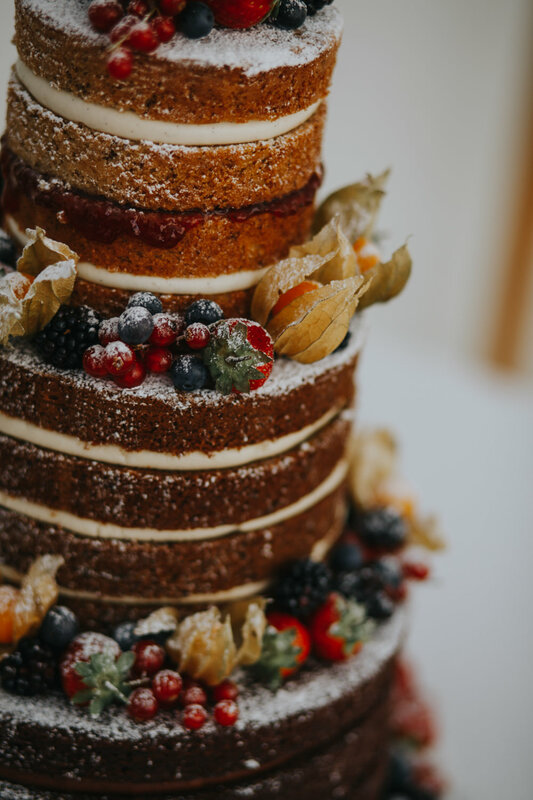 We went for three different tiers: chocolate with chocolate ganache frosting, sticky ginger cake with salted caramel frosting and vanilla sponge with strawberry preserve – all vegan, of course! 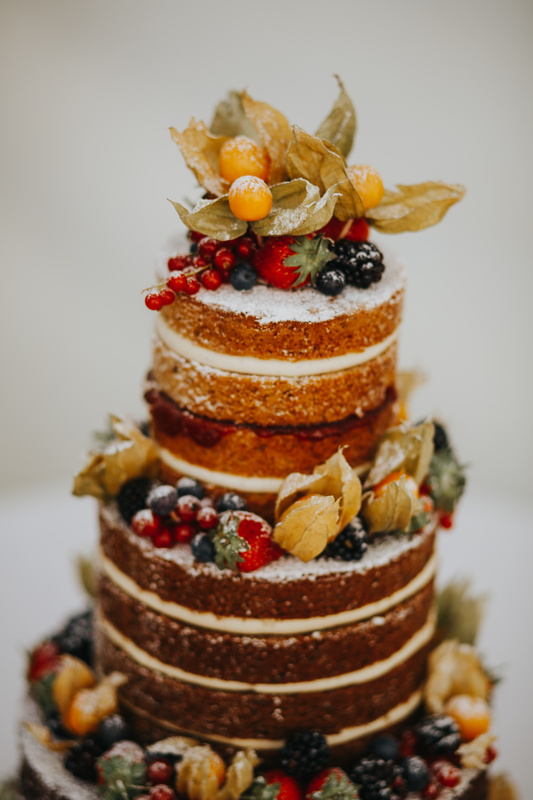 The cake was beautifully decorated with seasonal fruit and our guests enjoyed it so much that we didn’t even have any left over after the wedding. We also ordered some extra brownies for our gluten free and soya intolerant guests and they went down a storm. As cliché as it sounds, enjoy the day as much as possible and don’t sweat the small stuff. 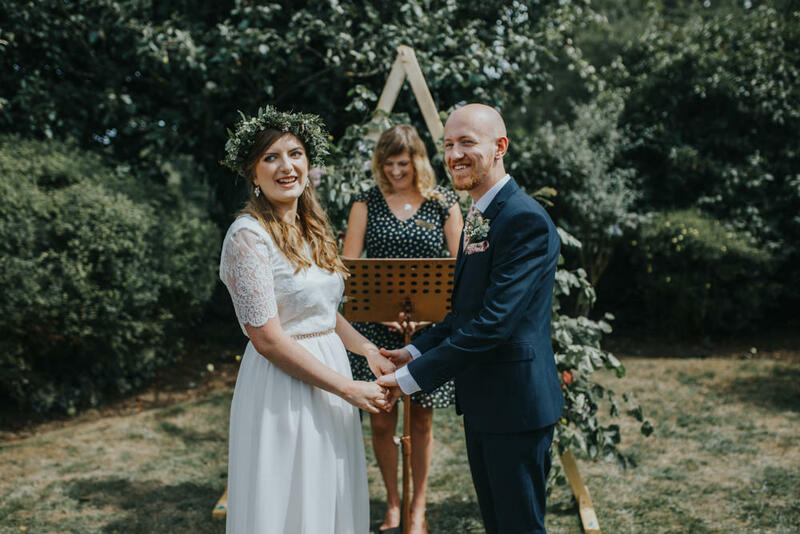 We had a few slip ups on the day – including leaving our personalised guest book at home, which caused a minor breakdown – but none of the guests noticed a thing. 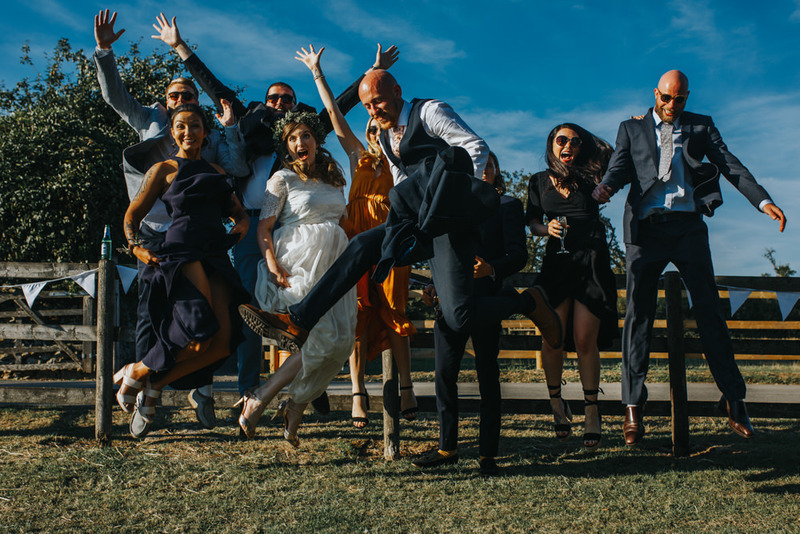 As much as I loved the day, I did find it difficult to relax until the evening when I could get changed and dance with my friends and family (the tequila shots definitely helped with this).